When Trish Santinon arrived back to her Heathcote Junction home recently, she noticed her dogs Winston and Lily barking like crazy which prompted her to check her CCTV system and was startled by what she found. 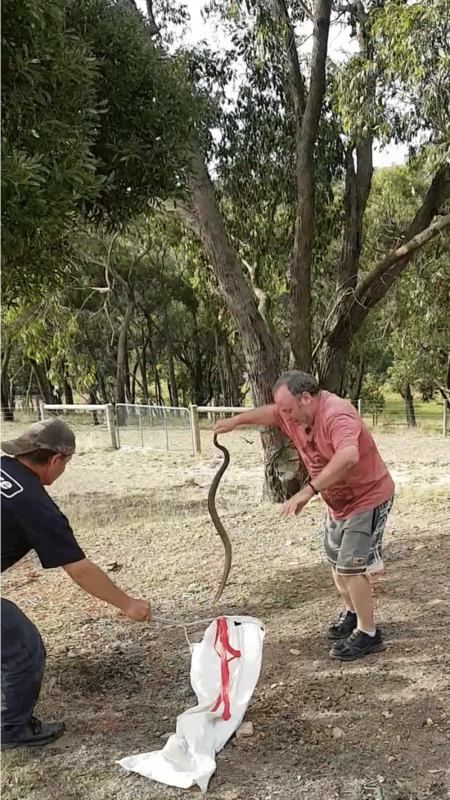 Just minutes earlier, a copperhead snake had slithered into her backyard and under her verandah, prompting her to immediately call her neighbour Simon Perry. This was just the second snake experience in Ms Santinon’s residence since she moved in 17 years ago and it was something which startled her. She called The Snake Removalist Anthony Calleja who spent 40 minutes removing the serpent. The home owner said she was forever grateful to those who helped her. “I haven’t had many run ins with snakes before, I know they are there and I respect them, but it did scare me,” she said. “I was very panicked but thankfully Anthony took him very far away. He was just warning us to not attack them, just let them be. After her sighting, Ms Santinon’s story was part of another media organisation’s attempt to frame the region as a snake capital. But The Snake Removalist, Mr Calleja, said it was actually Wallan that more snakes were being found in curious places. “Snakes are always more frightened of us than we are of them, and people need to educate themselves because they are not scary or as dangerous as people think,” he said. “I wouldn’t say it was the snake capital. They are around. They always stay away from humans because escape is always their first option. “To be honest, I see more in Wallan. I have had a lot of calls around there. “If you do see a snake, stay a safe distance and back away slowly. Don’t try to go near it or hit it with a shovel as it could become defensive.